In this week’s edition of Forward Today, Scott reflects on how scripture is an intergenerational way to learn about and experience God’s love. 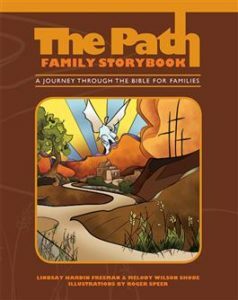 This Wednesday’s sale features The Path: Family Storybook. Last week, as I wrote here, I was at the Episcopal Youth Event in Oklahoma. It was a grand event with 1,300 teenagers and adults. One of my roles there was to staff the Forward Movement table in the exhibit hall, and I had the chance to have good conversation with lots of folks. There was a good deal of interest in The Path: Family Storybook. It goes with a whole set of resources designed to encourage children, youth, and adults to engage with scripture. The core idea is to present the stories of scripture in a way that reveals the grand narrative arc of God’s great love for us from the moment of creation, through Jesus Christ, up to today, and for ever. I’ve been thinking about all this lately. We in the church sometimes wonder why younger people aren’t as interested in church as we might hope. Never mind that our picture of the past might be rosier than reality, the fact is that it’s no surprise. Why would anyone–of any age–be interested in church if they don’t know about God’s love for them as revealed in Jesus Christ? It isn’t enough to say God loves you, but we need to teach some of the ways God loves us. Imagine if I told my spouse I love her, but never acted like it. Now imagine if I told people God loves them, but didn’t act like it or show how that’s true. Opening the pages of scripture is an amazing way to see God’s love for people from generation to generation. It’s something that we can all do, regardless of our age. Adults can fall in love with scripture, and so can children. There are loads of ways to do this, and one of the great gifts of God’s word is that it creates a level playing field. The eight year-old and the seminary graduate can sit together and bask in the glory of God’s great love. Have you read the Bible lately, for the sheer joy of it? Have you looked for a way to share the amazing riches of scripture with a child or younger person you know? Let us all commit to engaging the scriptures. It will change us and our world.